Founded in 2015, MyHost offers domain registration services plus secure web hosting with unlimited bandwidth, VPS, and dedicated servers to Israeli and European customers. Their free hosting platform is suitable for designers and developers who are looking for staging environments and amateurs learning to build websites. MyHost offers reliable hosting packages with a 99.9% uptime guarantee, in addition to value-added products such as domain registration and SSL Certificates at fair prices. Located in Israel and Europe, their SSD-based servers are protected from DDoS attacks and manned by an on-site technical support team. 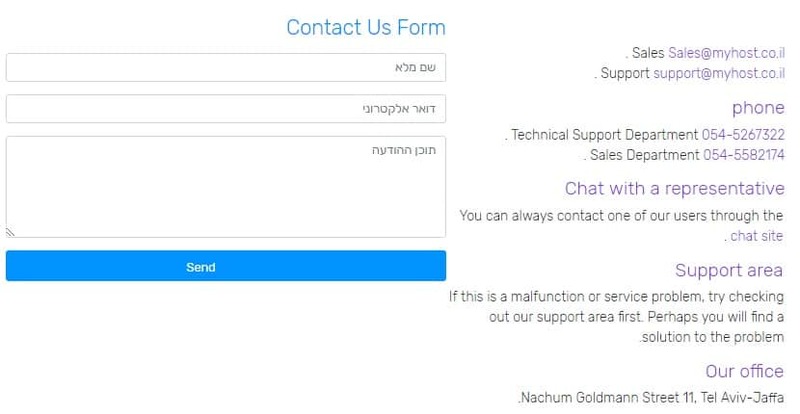 Their website is in Hebrew. MyHost is one of the few Israel-based hosting companies that provide a free starter web hosting package for their customers. With this plan, you get everything you need to take your business online. The ad-free package includes two databases and a free subdomain as well as FTP and a file manager that you can use to import files. When you sign up for this plan, you also get the Sitepro website builder free for a month. You can use it to create a simple personal blog or business website. Website speed and security underpin the success of any website. MyHost’s servers are based on LiteSpeed with SSD storage, which ensure your websites load quickly, and CloudLinux OS with good security settings and extensions that you can configure for maximum security. Reseller packages come with a number of defenses including protection from DDoS attacks. Don’t worry about backups as they carry out daily backups via an automated and synchronized system. MyHost offers great value for money even with their free starter package. 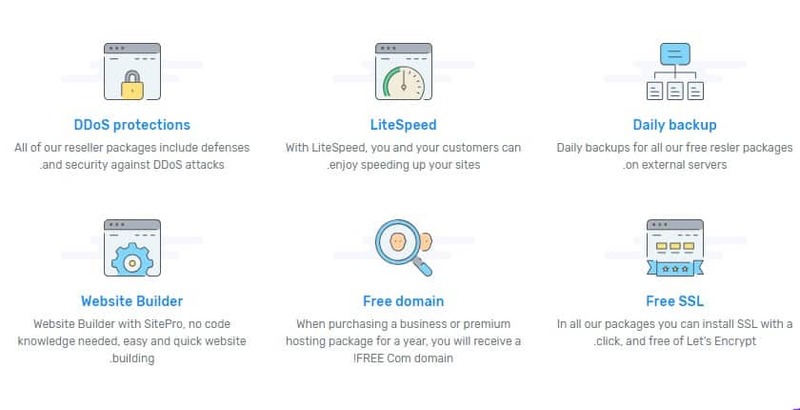 When you upgrade to their annual business or premium hosting package, you get even more value as their plans include a free .com domain ,unlimited databases, a free Let’s Encrypt SSL certificate, and unbeatable support. Even with all of these goodies, they’ve kept their prices remarkably low. You have seven days to try out their hosting services for free before committing to their monthly or annual plans. Customers are encouraged to check their support area (the equivalent of a knowledge base) for answers to various hosting issues before they open a ticket, call their technical support department, or chat with their representatives. Any interactions you have with the technical support team are sure to be positive as they’re both warm and professional. When not responding to requests, they’re monitoring servers to ensure they’re not overloaded and remain healthy. With servers in multiple locations, MyHost is a pretty good choice for people looking for fast and secure hosting packages for their websites and web apps in Israel and the EU. Grab a Free MyHost Starter Package!